I am in love with flight path, it is beautiful. And as soon as you have akit with a pattern I will be getting one. Thank you for hosting the Autumn hop so that this creative quilter could make this beautiful quilt. Mary, I am so proud of you! The quilt is fabulous. 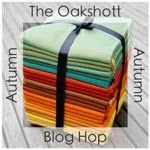 Didn’t know you were entering it into the Oakshott autumn challenge. You go girl!